The face plays a critical role in human communication. Just looking into a person’s face can tell us so much about who they are and how they are feeling: a wide smile connotes joy and pleasure, a wrinkled brow shows worry or fear, pursed lips or a frown can mean anger or sadness. Many of the judgments and assumptions we make about others are based solely on what we see in their faces. And when we examine ourselves in the mirror, the first thing we see is our face. Dr. Brent Moelleken and the staff at Moelleken Plastic Surgery know just how critical we can be about our own faces, and how important our facial appearance is for our self-confidence and well-being. Do you have a blemish or a feature that you are tired of trying to hide or minimize with make-up? Are you are concerned that your face is starting to show the effects of sun damage or aging? Have you experienced a facial trauma or were you born with a facial abnormality that you would like to correct? Dr. Moelleken’s goal is to understand what you would like your face to tell the world about you, and to apply the most modern, state-of-the-art surgical techniques to achieve those goals. Dr. Moelleken is twice board certified in plastic and reconstructive surgery, and one of only three surgeons in the world to complete the year-long Aesthetic Surgery Fellowship at UCLA. He and his staff at Moelleken Plastic Surgery in Beverly Hills and Santa Barbara will listen closely to your needs and develop a unique surgical treatment plan to ensure that your face shows the world how attractive and confident you really are. Last year, more than 600,000 facial surgery procedures were performed in the United States, the most popular being nose surgery (rhinoplasty) and eyelid surgery (blepharoplasty). 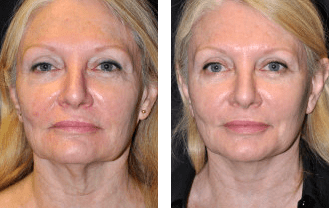 In fact, there are surgical techniques designed to address just about any facial feature, including ears, chin, forehead, and cheeks, as well as nose and eyelids. And thanks to the development of advanced medical devices, many of today’s facial procedures are minimally invasive and can be performed using only local and/or intravenous anesthesia. Facelift (Rhytidectomy) provides a more youthful appearance by tightening your facial skin, muscles and removing excess skin. 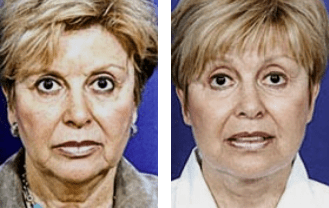 Forehead Lift (Brow Lift) is often performed in conjunction with blepharoplasty to improve brow positioning, droopy eyebrows, minimize frown lines, and reduce forehead wrinkles. Eyelid Surgery (Blepharoplasty) removes fat and excess skin from your upper and lower eyelids and can be performed alone or in conjunction with other facial surgery procedures. This surgery improves the function and look of your eyes. Lip Enhancement will reshape your upper and lower lip to give a more aesthetic or youthful appearance. Augmentation of the lips is accomplished using various materials that help “plump” your lips, creating fullness and decreasing vertical lines. Neck Lift or contouring your neck with liposuction and tightening your neck muscles and skin are a key part of facial rejuvenation. Even if the rest of your face has been lifted and excess skin removed, you will not achieve your desired look if sagging jowls or a double chin are still present. Nasal Reconstruction (Rhinoplasty) can reduce or increase the size of your nose, change the shape of the tip or the bridge, narrow the span of your nostrils, or change the angle between your nose and your upper lip. Rhinoplasty/Septoplasty is surgery of the external and internal nose in which cartilage and bone are restructured and reshaped to improve the appearance and function of your nose. Ear Surgery (Otoplasty) is usually performed to set prominent ears closer to the head, change the shape, or to reduce the size of large ears. This surgery reshapes the cartilage of your ears so they protrude less. Facial cosmetic surgery may refine, enhance, or rejuvenate your existing features and how much or how little you want to change your appearance depends on the extent of the surgical procedure you choose. Cosmetic surgery is not limited to correcting minor or major deformities. It can also help people who don’t have anything actually wrong; they simply wish to improve their overall level of attractiveness. Dr. Moelleken offers all aspects of cosmetic and plastic surgery and non surgical procedures include cosmetic injections, laser skin rejuvenation, and skin care treatments. Dr. Moelleken has also innovated numerous cosmetic surgery procedures, including LiveFill®, the 360 Facelift®, the USIC®, and the LUSIC® cheek lift to restore harmonious youth and beauty to your face. At Neo Surgical Center, we take the time to understand your reasons to seek improvement because we know that your decision is, first and foremost, an emotional one. Double board certified facial plastic surgeon Dr. Moelleken and his staff are very pleased to combine the latest innovations in facial plastic surgery with personalized care and the utmost in confidentiality. Our approach encompasses several stages to help you achieve the goal of looking as good as you feel and it is important to understand that your age, health, skin texture, bone structure, healing capacity, personal habits, and lifestyle are all factors that may affect the results of your surgery. Dr. Moelleken will individually consult with you to help you arrive at a desired appearance to meet your specific needs. Using a computerized aesthetic imaging system, you can evaluate potential surgical results together while viewing a computerized video image to help you reach decisions more confidently. Whether you need plastic surgery or cosmetic surgery for the first time or are looking for revision plastic surgery, through medical expertise and compassionate care Dr. Moelleken will help you put your best face forward.